San Diego, CA USA Set #13 - Hero Composite - San Diego, CA - Car travels S on Interstate, on a cloudy day in light traffic. Shot on RED Dragon. 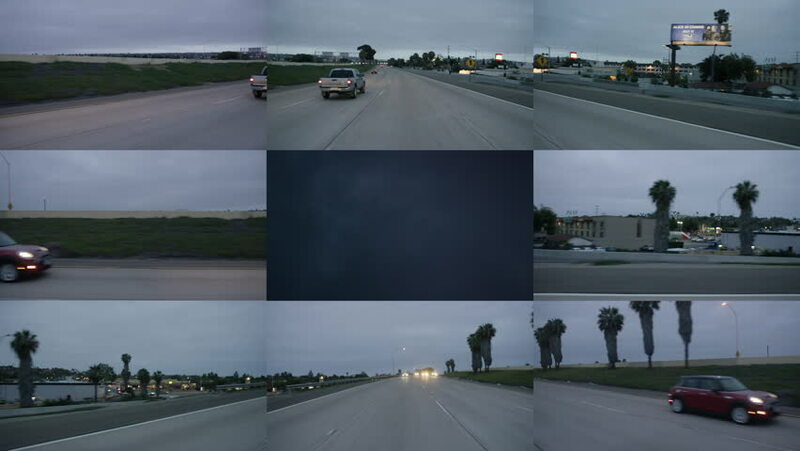 hd01:30San Diego, CA USA Set #7 - Hero Composite- San Diego, CA - Car travels W on Mission Bay Dr., then turns and travels N on Mission Blvd on a cloudy sunset in light traffic. Shot on RED Dragon. hd01:30San Diego, CA USA Set #1 - Hero Composite - San Diego, CA - Car travels S on Ingraham St., on a cloudy day in light traffic. Shot on RED Dragon. hd01:30Freeway: Alameda County, CA USA Set 3 - Hero Composite: Car travels E on I-580, takes exit for Hacienda Drive and turns N on a clear day in light traffic. Shot on RED Dragon. hd01:30San Diego, CA USA Set #10 - Hero Composite- San Diego, CA - Car travels S on Mission Blvd, on a cloudy sunset in light traffic. Shot on RED Dragon. hd01:30San Diego, CA USA Set #3 - Hero Composite- San Diego, CA - Car travels S on Ingraham St., on a cloudy day in light traffic. Shot on RED Dragon. hd01:30San Diego, CA USA Set #12 - Hero Composite- San Diego, CA - Car travels S on Interstate, on a cloudy day in light traffic. Shot on RED Dragon. hd01:30Venice, CA: Los Angeles, CA USA Set #12 - Hero Composite: Car travels W on Windward Ave. on a cloudy day in light traffic. Shot on RED Dragon.